This afternoon has been a REALLY bad one internet wise (must be some sort of connectivity problem but I really am not sure) so forgive me if I am going to be brief for now! Here is a picture (especially for you Dawn!) of my latest effort at stitching on felt, a soft bracelet in merino and hand dyed yarn, thanks Lisa from The Tin Thimble for the pressie of the gorgeous yarn, I love it!!! 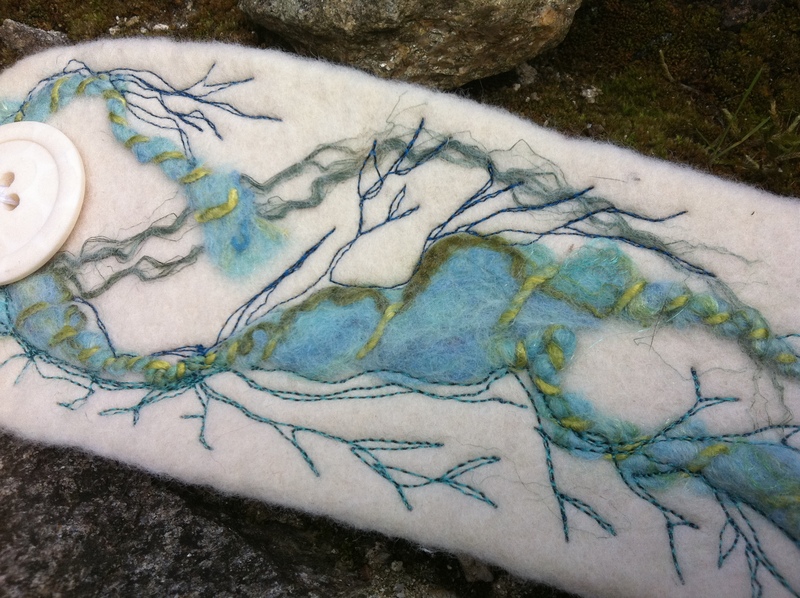 On Saturday I am hosting a felting workshop at Clasheen and I have one place left if anyone is interested. We will be primarily concentrating on three dimensional felt but if any total beginner is lurking out there in cyber space do give me a shout, this would be a really great opportunity to learn the basics of wet felting in a fun and supportive environment. Right, I’m going to shut this computer down now and hope that tomorrow will be a new day, good night! This entry was posted in Felt, Free machine embroidery, workshops and tagged Clasheen, Felt, felt workshops, Felting, felting workshops, free machine embroidery by Nicola. Bookmark the permalink. Keep up the good work…I really do love it!!! !